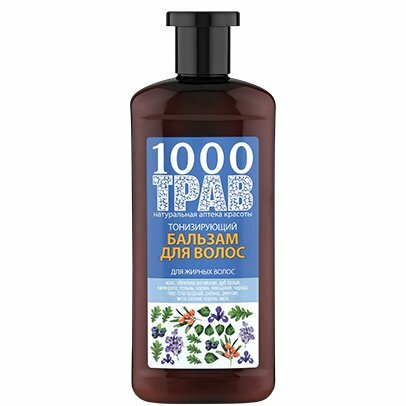 Energising Hair Conditioner is produced by the Russian cosmetic brand 1000 Herbs. It is specifically designed for oily hair. The product contains active plant ingredients that normalise sebum secretion, freshen your hair, have an intense moisturising effect and energising properties, enrich your hair with vitamins. This conditioner has a light texture and does not make your hair look greasy which is especially important for oily hair and scalp. The product contains calendula, iris and white oak extracts which regulate sebum secretion. Ginseng root extract has moisturising and antioxidant properties, beggarticks helps to prevent greasy shine and has a soothing effect. Natural oils and herbal extracts. Iris, Altai sea buckthorn, white oak, calendula, nettle, wormwood, ginseng root, beggarticks, bay laurel, mountain ash, elecampane, peppermint, calamus root. Effect. Your hair remains fresh and clean twice longer. Directions. Apply onto clean, wet hair. Spread evenly. Leave for 2 to 3 minutes. Rinse with clean water. Ingredients. Aqua with infusions of Iris Florentina Root Extract*, Hippophae Rhamnoides Oil, Quercus Robur Bark Extract, Calendula Officinalis Flower Water*, Urtica Dioica (Nettle) Extract*, Artemisia Umbelliformis Flower Extract, Panax Ginseng Root Extract*, Bidens Tripartita Extract, Laurus Nobilis Fruit Oil, Sorbus Sibirica Extract, Inula Helenium Extract, Mentha Arvensis Herb Oil, Acorus Calamus Root Extract, Cetearyl Alcohol, Cetrimonium Chloride, Ceteareth-20, Guar Hydroxypropyltrimonium Chloride, Neroli Essential Oil, Citric Acid, Benzyl Alcohol, Benzoic Acid, Sorbic Acid. Want to buy Energising Hair Conditioner? Call us or submit your order via our web site! 1000 Herbs is a cosmetic brand owned by the company Pervoe Reshenie (First Solution) that is well-known in Russia and its neighbouring countries due to its numerous beauty brands such as Organic Therapy, Planeta Organica, Grandma Agafia Recipes, Bioluxe, Organic People, Zero, Mama&Baby, Handson, and others. Its 1000 Herbs series includes hair and body care products such as shampoos, hair conditioners, body creams and scrubs, foot and hand creams. Pervoe Reshenie has been successfully operating in the Russian cosmetic market for many years. The company is constantly evolving in an effort to provide its customers with high-quality natural and organic cosmetics which are simultaneously effective and affordable. The brand 1000 Herbs embodies the key principles of the company’s philosophy formulated by its specialists years ago. They include, but are not limited to, effective recipes with natural extracts and oils extracted from medicinal plants; convenient and ergonomic packaging; affordable price. Thanks to these principles, almost everyone can afford natural and organic beauty products for gentle skin and hair care.